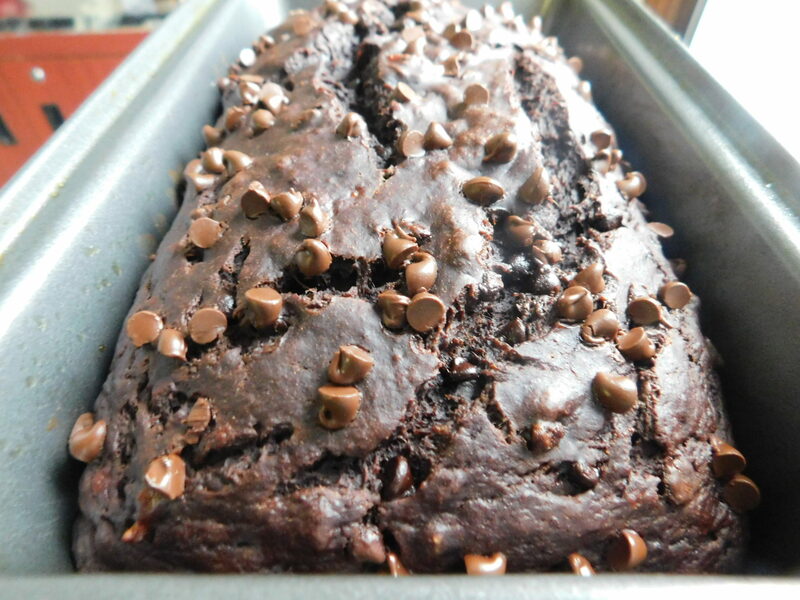 Double chocolate banana bread - Drizzle Me Skinny!Drizzle Me Skinny! Happy New Year friends! I can’t wait to see all the recipes I create this year, I try to mix things up as often as I can to bring you new baked good recipes as well as family meals. Baking is my favorite thing to do so for my first recipe of 2018 I went with a decadent fresh baked loaf because there is just nothing quite like it, I love the smell of the house while it’s baking and enjoy a fresh slice with a cup of tea. I had banana’s that needed to be used up, and I was craving chocolate (I mean let’s face it, when am I not craving chocolate!) 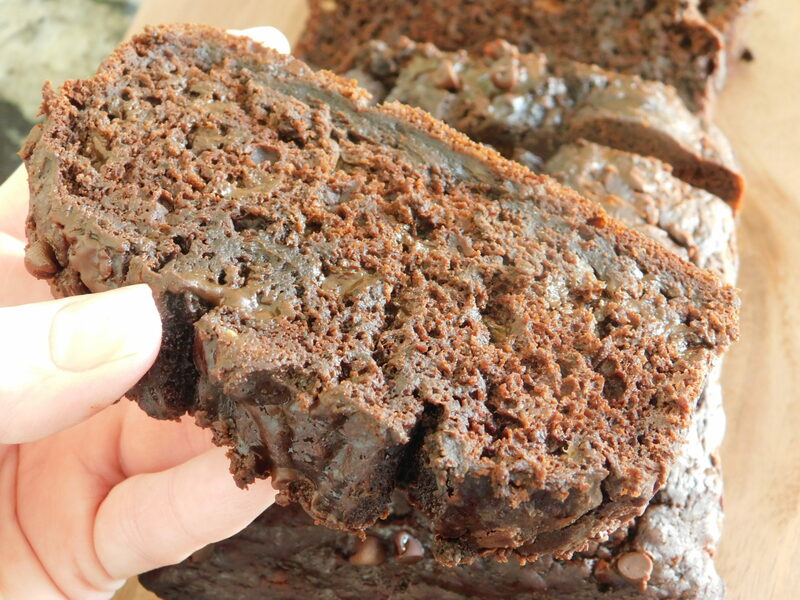 so in the oven went this double chocolate banana bread and oh my was it delicious…like chocolate cake, yes ok.. banana flavored chocolate cake.. 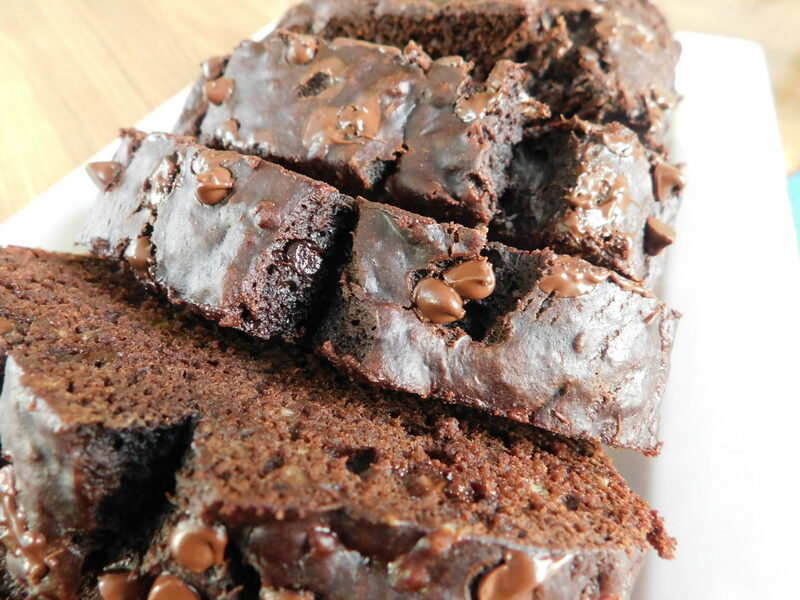 I think you will love this one and it’s just 4 smart points per serving.. Bake one up today! In a bowl whisk your egg and brown sugar together. Mix in your mashed banana, apple sauce and vanilla. 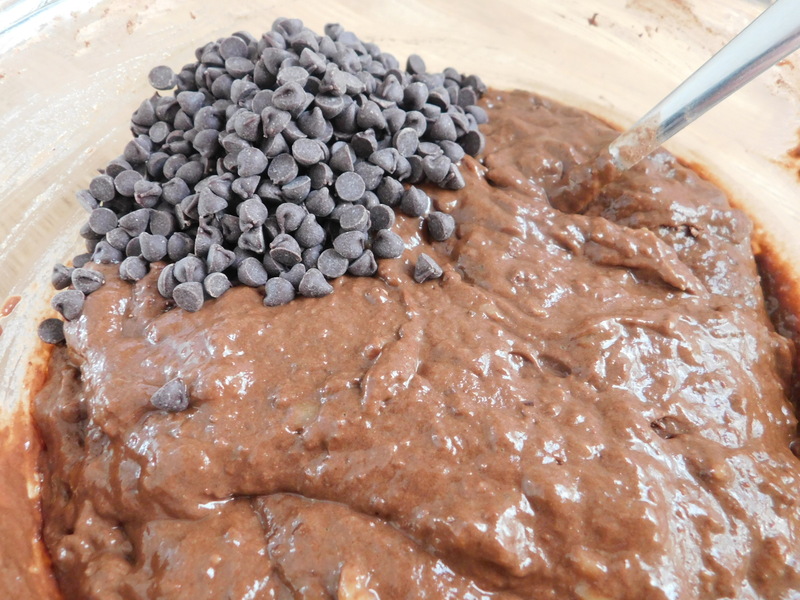 Stir in your flour, cocoa powder and baking soda. Pour batter into your loaf pan and sprinkle with remaining chips, bake in oven for approx 50 minutes. Let cool then cut into 10 equal servings, loaf will freeze well, best stored in fridge. *Nutritional info includes banana & apple sauce, SP &PP were determined before adding these ingredients. Is this 4SP per slice? Also, is it 10 slices per loaf? I’ve tried to find you on weight watchers connect but can’t find you there. I’ve been stalking your Pinterest and blog all day lol! Youbhave fantastic recipes. I’m newlifenow18 on WWand 1 wk new! Yes I couldnt find where I left the comment. I thought it didn’t post lol. You are on WW connect? I see #drizzlemeskinny all over the place there. So glad I found this! Is there a subsitute for the apple sauce? Really want to make this but dont have that in my cupboard! Thanks! I made this tonight, I made 8 mini loaves for easier portion control, came out to 5SP. They smell so good I can’t wait to try it. Just made this, and WOW! Absolutely delicious. I substituted the brown sugar with Splenda brown sugar blend and that brought it down to 3SP per slice. Love all of your recipes. Do you think these would turn out as well in muffin cups? I made them as muffins and they were great. Baked at 325 convection for 18 minutes but I recommend checking them at 16 minutes. I added 5 chocolate chips to the top of each one got 14 muffins. 3.12 points each. I’m going to try them again but leave out the cocoa powder and chips and make cinnamon vanilla with a little sugar free raspberry jam in each one. This is amazing! Thank you so much for all the time you spend creating such delicious things for people on weight watchers! Hi first of all thank you so much for posting your delicious, amazing recipes. I was getting a little tired of eating healthy then I found you and I swear EVERYTHING that I haste made is delicious!! This bread is so so good, I used stevia in place of the brown sugar but other than , that I didm;t change a thing and it is Amazing. Sooooo goood! Made these tonight and even hubby was surprised at how good they were! I have everything to make this at home but the bananas. My flour is self rising though…should I eliminate the baking soda from the recipe? Hi! I just made this tonight and it turned out amazing!! I’ve lost 10 pounds since starting weight watchers in January and I must say your recipes have a lot to do with my success thus far. I meal plan for the week with your blog. You’re amazing. Thank you for sharing your recipes! YUMMY!!! 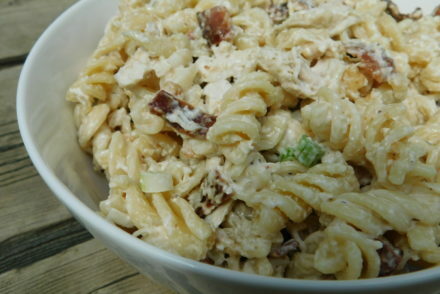 I made this recipe recently and it was amazing!!! So deliciously chocolatey! Thank you! WOW, is this delish! OMG could not believe it. I thought it may be dry or bland, but certainly not. Hopefully I won’t eat the whole thing today. Great idea but too late my family ate it. They preferred it over the traditional banana bread I made for them. Hi, this looks delicious! Do the bananas have to be over-ripe or is ripe ok? Ok thanks! Looking forward to making it tomorrow. Omg! Made this in Wilson donut pans…I got 12 donuts for 3pts each (rounded up from 2.5). So amazing! Love this site! 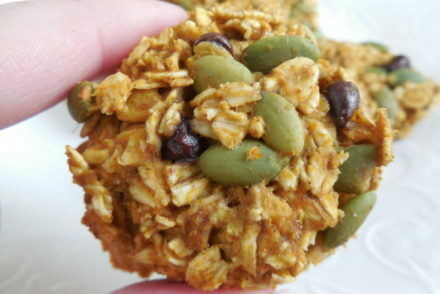 Can I use regular semisweet chocolate chips? Just made 20 mini muffins – 2sp. Such a great chocolate hit. I make add a touch of salt next time (personal preference). Thanks for such an easy and awesome recipe. I’m just curious because when I figure out the points using your nutritional breakdown it comes out to six points per serving. I’m using the Weight Watchers calculator but can’t figure out what I’m doing wrong because you have it as four points. I made the recipe tonight by the way and I enjoyed it. Yes it does and thank you for the reply. I’ve been looking for some sort of chocolate cake type food I could make that wouldn’t blow through all my points, but still taste good. I hit the jackpot! I love this one and so do you kids because there’s nothing artificial about it, I can share it with them. just put this on my list for sunday’s shopping. i am sooooo excited. I made this and they are very good… but my WW calculator for smart points comes out to 6 sp. Did anyone else get this? I have made this bread 3 times now and it is delicious! Thank you for the recipe. I’m actually enjoying a slice right now with fresh cut strawberries on the top. So yummy! Can you make this in a bread machine instead of the oven? What changes would need to be made if so? Do you have recipes for a bread machine? Hi, I am on classic and was wondering if the nutritional value includes all ingredients or do I need to add value for banana, apple sauce and egg? So I ended up here because I have 2 very ripe bananas that need to be put to good use. I really want to try this one, but it seems as though I’m short one banana! Is there any way I can adjust the recipe to use 2 bananas instead of 3? 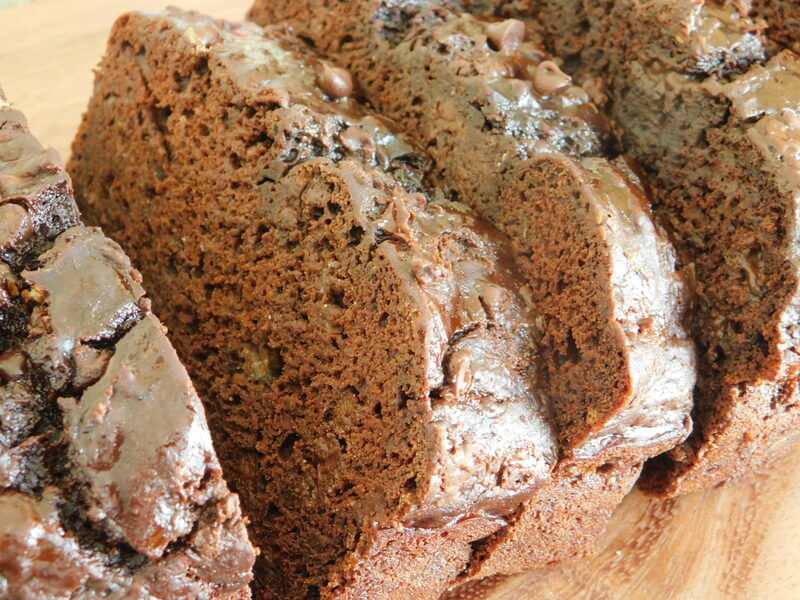 I made this recipe as a mini chocolate cake for a treat. I had some leftover chocolate frosting I needed to use. It was 2 points on top of the points for the bread. It was so delicious and seemed so decadent. I’ve had it with a serving of PB2 over rand over. One of my kids loves it too. Made a mistake the other night and forgot the brown sugar….still absolutely wonderful without it. I make 6 large muffins at 5 points each without brown sugar! I just made this loaf and it was delicious. Thank you so much for coming up with all your great recipes, especially for those of us with a sweet tooth. 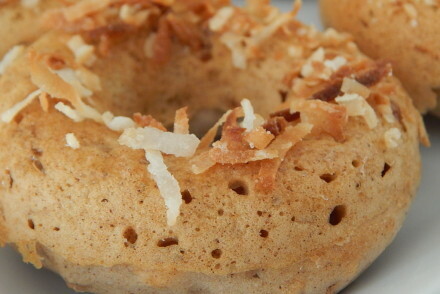 I have made your cinnamon donuts and your glazed sour cream donuts – I keep them in the freezer for craving emergencies. You truly make it easier to stay with Weight Watchers. Can this be made in mini loaf pans? And if so, how many would it make? Hi Christina, yes although I am not sure how many as I never use mini loaf pans, my guess would be maybe 3-4? This is so yummy! I made mine in an 8 count mini muffin pan. I used sugar free chips, so I kept it at 4 points per mini loaf. Do you think that was okay? 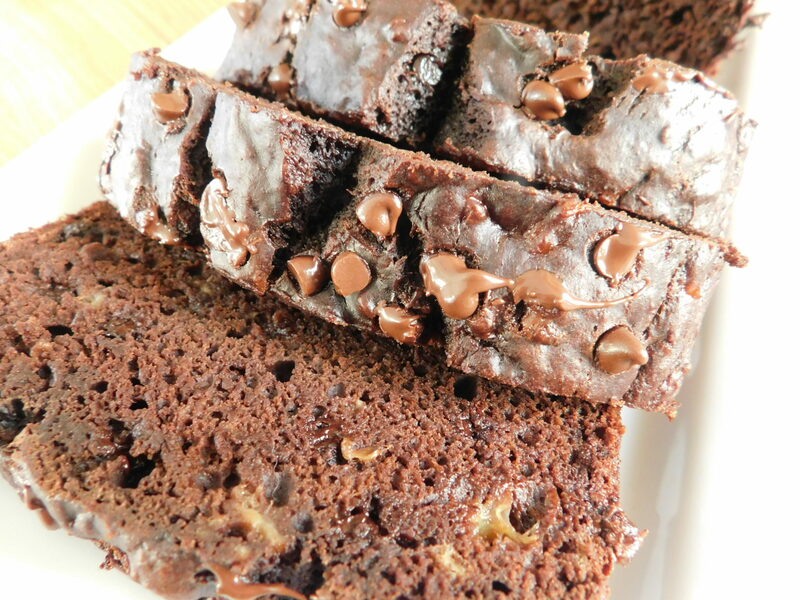 Also, what would happen to the points if we used Kodiak dark chocolate in place of the flour? And, how does the sugar free chips change it all up, too? Would I need to change the recipe much or just add a cup of shredded zucchini?